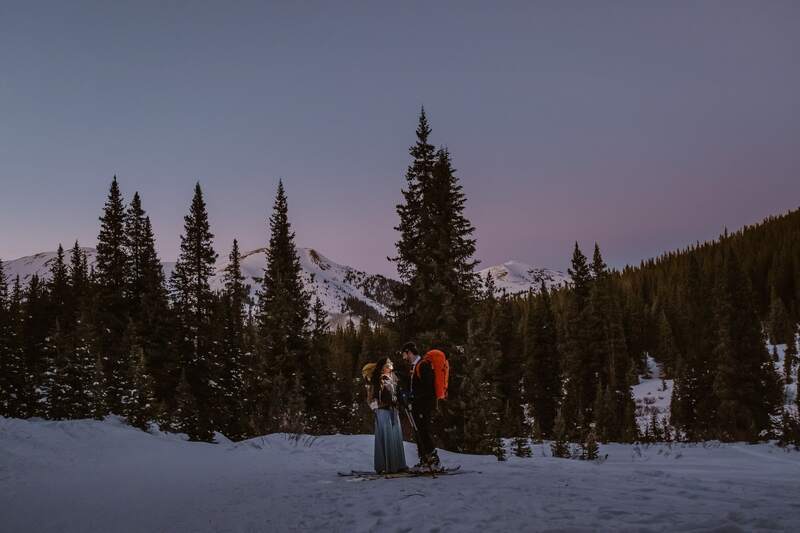 Imagine that you’ve found the perfect mountain location for your Colorado elopement. You’ve got the epic views, the golden hour lighting, the short hike that your mom insisted on … and a traffic jam lasting over an hour to get you through the entrance gate to Rocky Mountain National Park. That last part doesn’t sound like fun, am I right? Yet that’s the reality for many couples who choose to elope in Rocky Mountain National Park or other scenic Colorado mountain locations on weekends in summer. And I don’t know about you, but I would prefer to not have dozens of tourists taking photos of me as I hike along in my wedding dress! When couples book me to photograph their Colorado mountain elopements, and they don’t have a date or location set yet, I always recommend going with a weekday elopement. And luckily most of my couples trust my advice, and decide that having a spot to themselves on a Thursday morning or Monday afternoon sounds way better than fighting through crowds on a weekend. After all, isn’t the privacy and intimate feels part of why more couples are choosing elopements over bigger weddings? It shouldn’t come as a surprise that I as a photographer put this one first on the list, but it’s a big one. 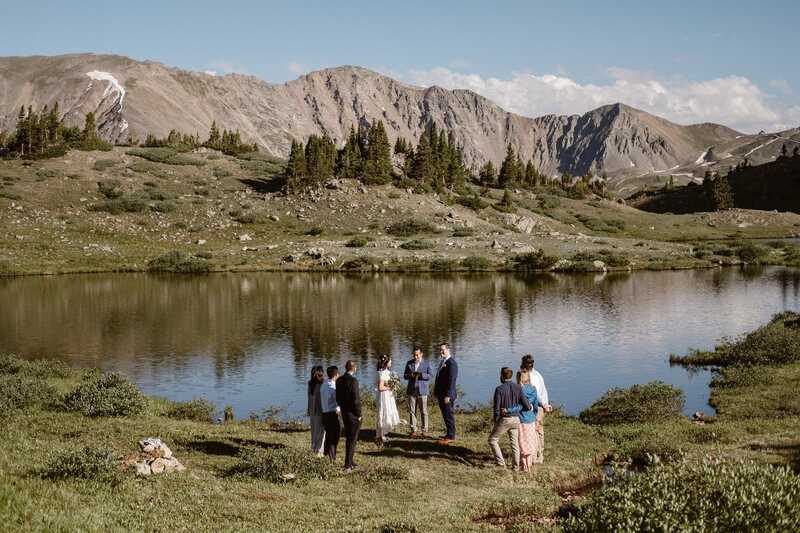 When you elope in a popular location, like one of the lakes in Rocky Mountain National Park, St. Mary’s Glacier, or Maroon Bells, there is a 100% guarantee that there will be other people there on a weekend. And unless you’re up for a serious game of “dodge the tourists” there are bound to be other people in the background of some of your photos. Not the end of the world, but it’s not something most people think about. Do not plan on driving into Rocky Mountain National Park between 10am-2pm on a Saturday or Sunday unless you’re willing to spend at least half an hour in line waiting to get through the entrance station. 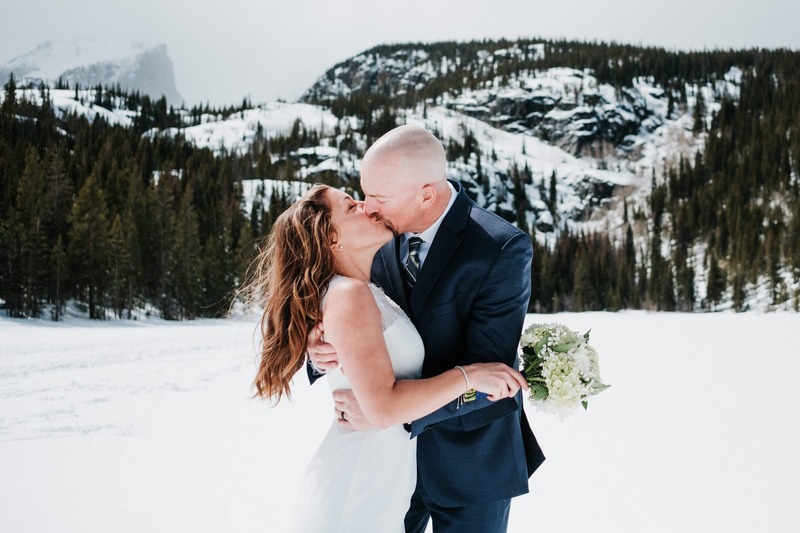 (Learn more in my Rocky Mountain National Park wedding guide!) 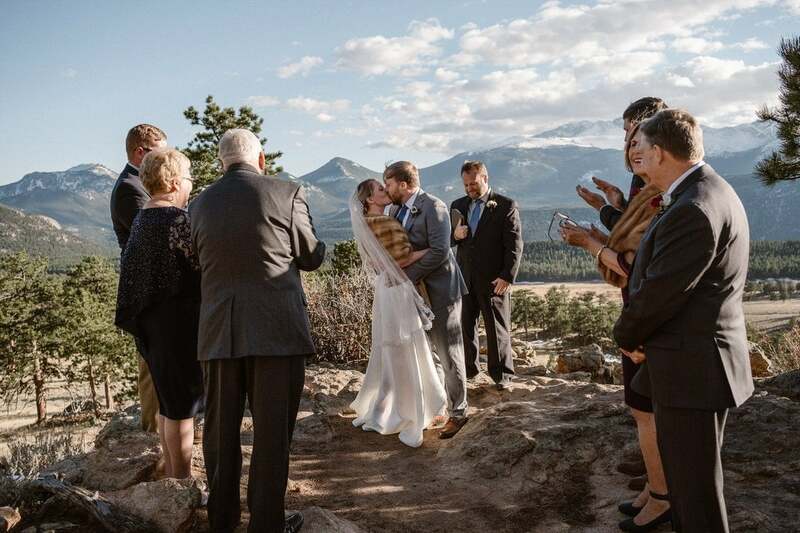 Trailhead parking lots all over Colorado often fill up very early in the mornings on summer weekends, and it can put a lot of stress on your plans if you can’t find parking at the spot you have picked out for your elopement ceremony. This can be especially bad in locations where you don’t have cell signal, and no way of communicating with your photographer or guests if you can’t find parking. With a weekday elopement, there’s less traffic, more open parking, and you can rest assured that everyone will get where they need to be! 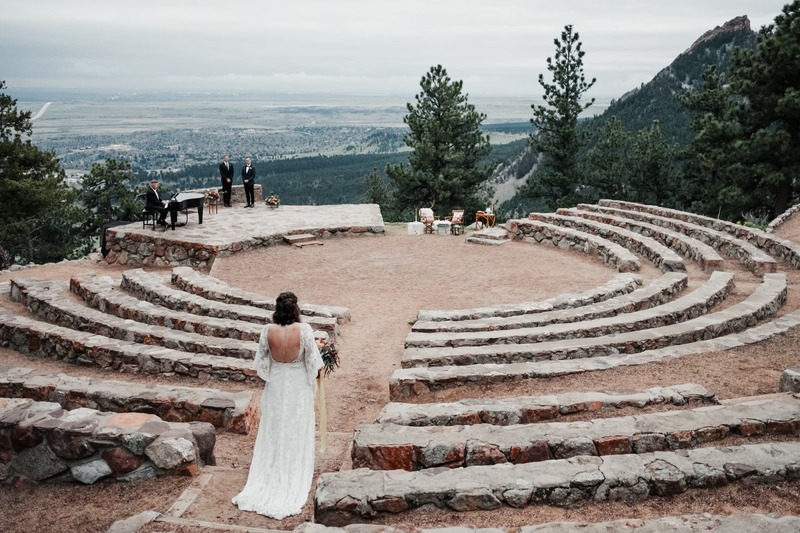 Many popular elopement locations in Colorado, like Sapphire Point Overlook near Breckenridge, Sunrise Amphitheater in Boulder, and the designated ceremony locations in Rocky Mountain National Park, can book up to a year in advance for popular summer weekends. And others, like Maroon Bells Amphitheater, only allows rentals on Monday-Thursday! If you have your sights set on one of these spots, you might have to pick a weekday to get the location you want. This should probably have been listed as number one, since it makes such a huge difference in how you’ll experience your wedding day both in the moment and when you think back on it. If you’ve been dreaming of spending a quiet day in the mountains with your partner instead of a big wedding surrounded by people, you want to give yourselves the best chance of having that quiet day. Imagine hiking up to your dream location without constantly being asked “Whoa are you guys getting married? !” or having a group of teenagers blasting their speakers in the background of your ceremony. Since couples with “big” weddings tend to book their photographer and other vendors earlier than couples who plan smaller elopements, my Saturdays and Sundays in summer are booked up to a year in advance. If you’re planning an elopement three months from now, picking a weekday means you’ll have more vendors to choose from rather than having to go with whoever is still available. Other vendors like florists often have large minimum booking requirements for weekends, but can put together a single bouquet and boutonniere for weekdays. Reason #6: Take a vacation day – or week! You might only have weekends off work, but if your elopement isn’t worth a vacation day, what is? If you can, I highly recommend taking the day before and after your elopement off from work as well. Rest, hang out with your partner, celebrate with your friends, go out for a long brunch (or longer hike!). Your elopement should be special, no matter how small you keep it, so allow yourselves the luxury of a stress-free experience if you can. No one wants to show up frustrated to their own wedding because they were stuck in traffic after work! If you need to have your elopement on a Saturday or Sunday, there are still ways for you to get some of the benefits of a weekday elopement. 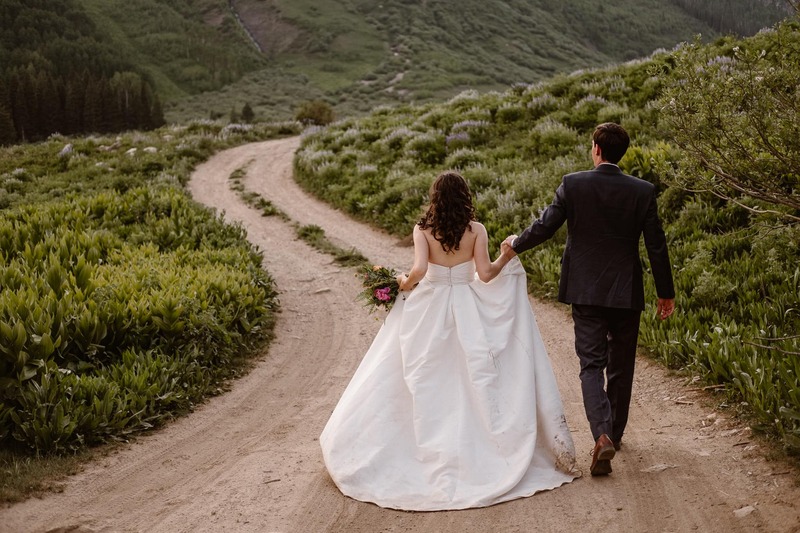 First of all, book a photographer who really knows the area you’re getting married, so that they can help you plan for things like traffic, trailhead parking, and the best times to avoid crowds on the trails. Some places are super busy at sunrise (I’m looking at you, Maroon Bells), while others are crazy busy at sunset (Lost Gulch in Boulder and sooo many others). A great photographer will always be able to suggest a more quiet or remote location! Really think about whether getting the one iconic shot of a famous location is worth dealing with dozens if not hundreds of tourists. And if you’re not afraid of snow, plan a winter weekend elopement! 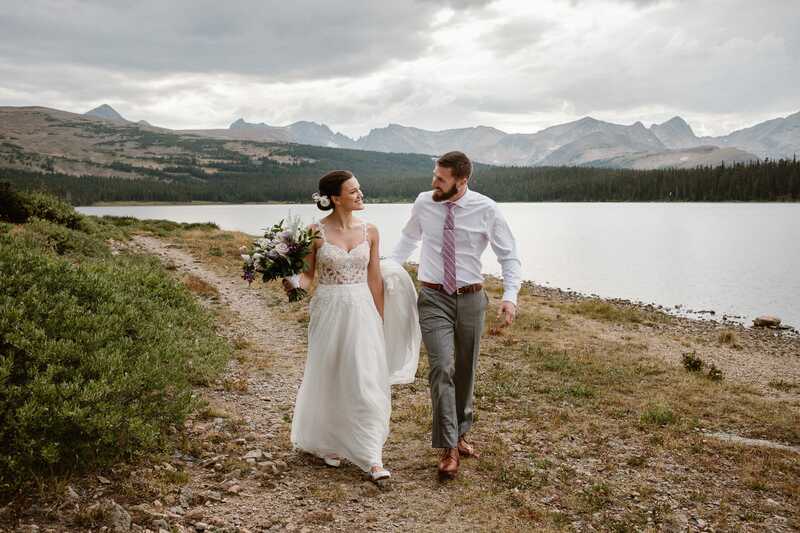 Holly and Matt eloped on a Thursday in Crested Butte, and we hardly saw anyone else on the trails that day. 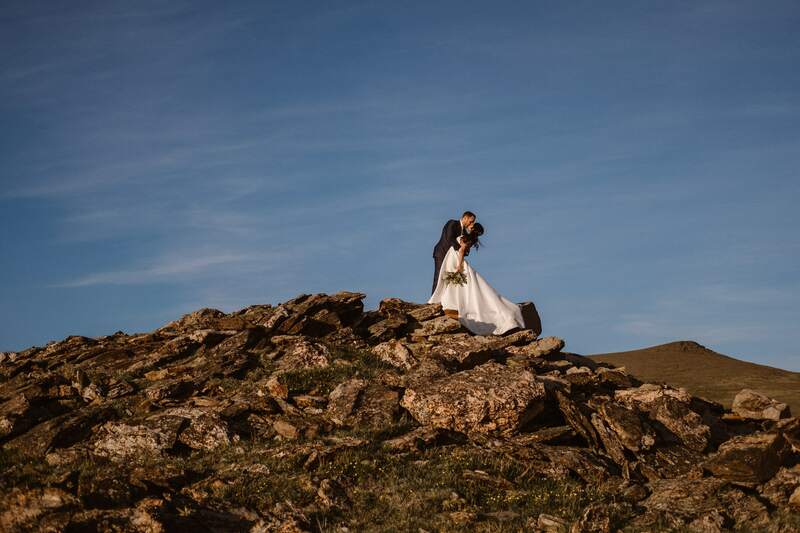 Diana and Will did their wedding photos in Rocky Mountain National Park on a Tuesday evening, and we had Trail Ridge Road almost to ourselves. Sae and Andrew eloped on a Saturday in July, but let me pick a quiet location for their sunset ceremony. I hope that was helpful to those of you who are still trying to decide on your wedding date! If you had a weekday elopement, I’d love for you to leave a comment and tell me why you chose that! And if you went with a weekend date, did you have to deal with crowds, or were you still able to have a peaceful elopement?